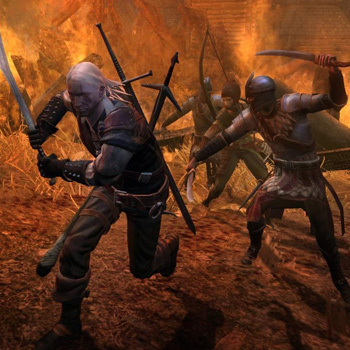 The Witcher combines spectacular and visually stunning action with deep and intriguing storyline. The game is set in a world created by best-selling Polish author Andrzej Sapkowski. The world shares many common features with other fantasy lands, but there are also some distinguishing elements setting it apart from others. The game features the player as a "Witcher", a warrior who has been trained to fight since childhood, subjected to mutations and trials that transformed him. He earns his living killing monsters and is a member of a brotherhood founded long ago to protect people from werewolves, the undead, and a host of other beasts. It's an action oriented, visually stunning, easy to use, single player RPG, with a deep and intriguing storyline.